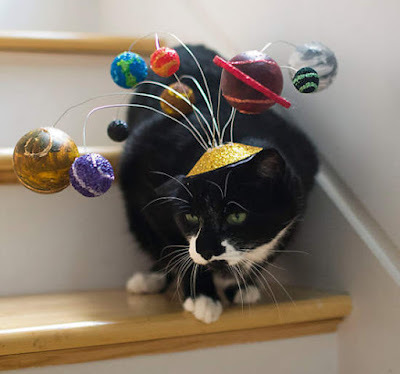 What’s even cuter than a furry-faced little critter? 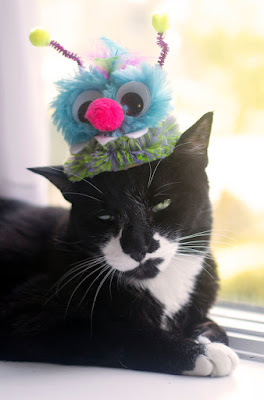 A furry-faced little critter wearing an adorable cat costume. so now it’s time to dress your fashionable felines some cool & fun costume. Because if there’s one animal that appreciates a good costume, it’s a cat. 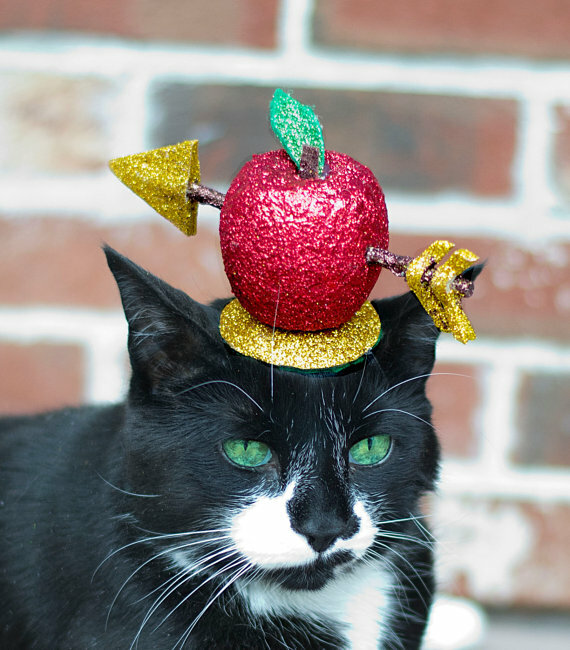 Here are a dozen costumes that are the cat’s meow. No one will suspet that you're a famous international kitty supermodel when you're cruising your"hood in these start glasses. 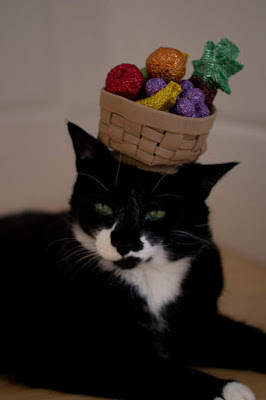 When you put a bowl of glittery fruit on your cat’s head, she’ll be just as happy and enthusiastic as the original Miss Chiquita. Your cat knows that it is center of the universe-- time to let it know you're in on the joke! 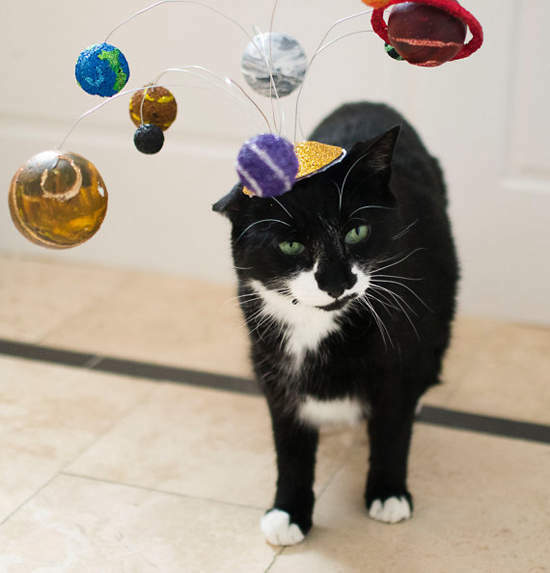 This cat fascinator is a model of our solar system with nine planets attached to the "sun" (cat hat base). 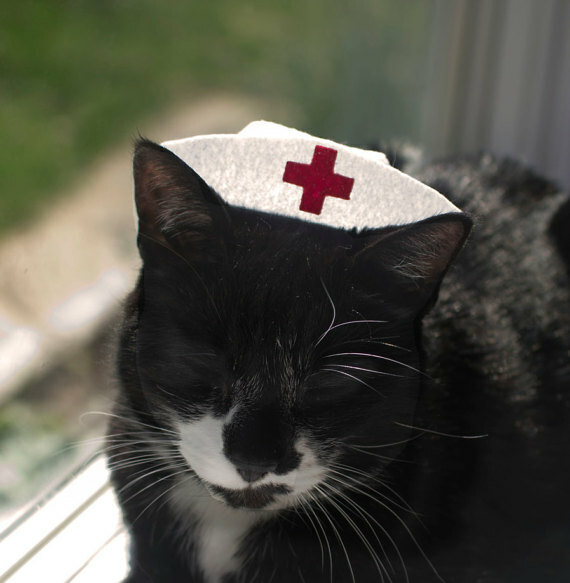 Made of stiffened felt that is hand-stitched together with a small elastic band that helps keep the hat in place for short periods of time on kitty's head. 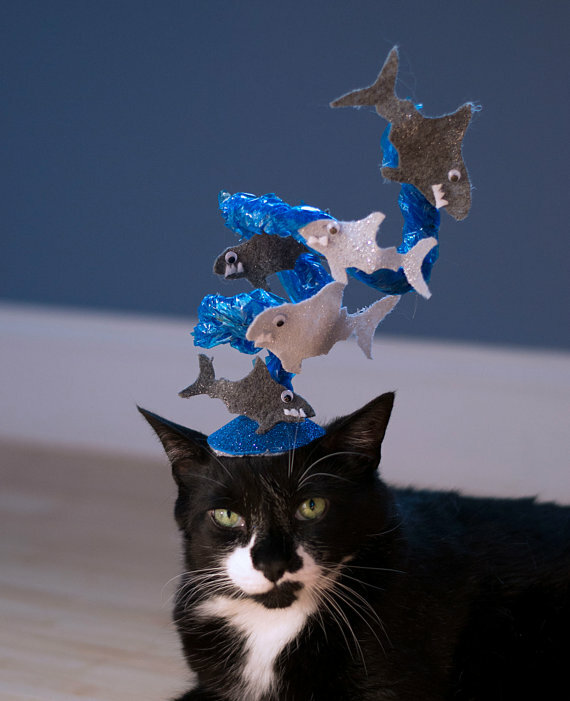 Don't worry..... No actual "shooting" took place anywhere near kitties for the creation of this hat! Everyone knows that cats love cheeseburgers--- now let your kitty wear his cheeseburger pride! 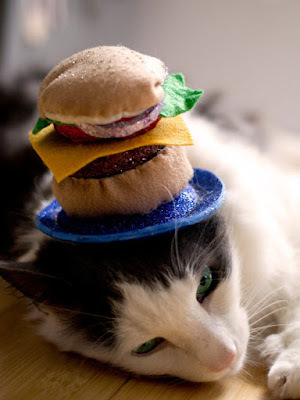 This blue plate special cat hat is the perfect outfit for Cheezburger Day, or whatever meme-based holiday your cat chooses to celebrate! Perfect for Halloween, or any time your kitty wants to dress up like a cute little creature, this monster cat hat should do the trick! 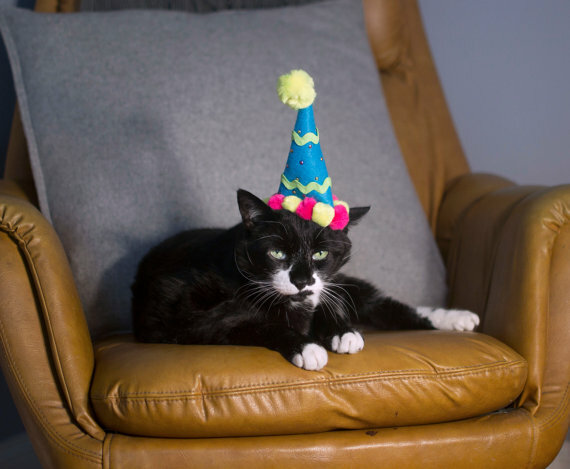 Whether your kitty is celebrating it's own birthday or helping you throw a party for someone else, this is the perfect cat hat for the occasion! 10. 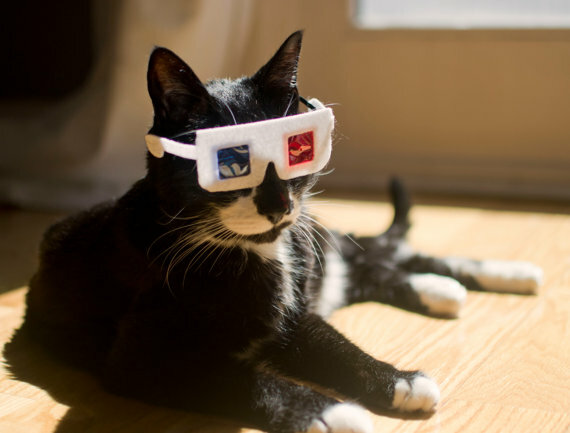 3-D Glasses for Cats! Have you been watching 3-D movies without offering kitty a pair? How rude! 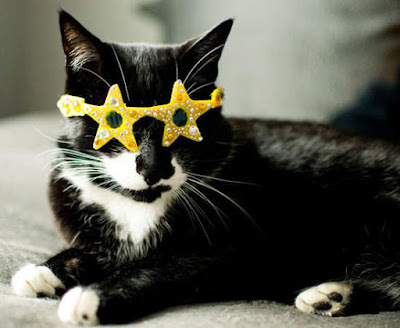 Perfect for 80s-theme party cats, TV-lovin' kitties, and any other time your kitty wants a low key cool costume.